The act of writing, it has often been said, may be interesting to the person doing it, but is boring as hell to watch. Writing is primarily an internal, cerebral activity taking place entirely inside the writer's mind, while outside he or she appears to be doing little more than tapping on a typewriter or staring into space. Yet Moonlight and Magnolias, the three-year-old comedy-drama by playwright Ron Hutchinson now on the boards at the Sonoma County Repertory Theater, depicts the writer's life in action. Moonlight and Magnolias tells the story of that legendary week in 1939 when producer David O. Selznick (Benjamin Stowe) impulsively shut down production of Gone with the Wind after just three weeks of filming. He fired director George Cukor, yanked director Victor Fleming (Chad Yarish) off the ready-to-wrap set of The Wizard of Oz and sequestered Fleming in Selznick's studio lot office along with screenwriter Ben Hecht (Justin Scheuer). Hecht reworked the script into the version that would become one of the most beloved films of all time. What probably happened during those five days was a whole lot of Hecht banging out pages while Selznick and Fleming watched. Needless to say, this would make for stultifying (if somewhat daring) theater, so what we get instead in Hutchinson's soft-focused romp is Fleming and Selznick acting out a condensed version of Margaret Mitchell's epic novel, Reduced Shakespeare&–style, as Hecht sits at the typewriter taking dictation and making acerbic observations about the dubious merits and questionable politics of Mitchell's Civil War melodrama. Is any of this believable? Not really. Can we accept that Fleming once donned a make-shift dress to vamp Scarlett O'Hara prancing and fiddle-dee-deeing her way around Tara, or dropped screaming to the floor to play poor Melanie giving falsettoed birth? Definitely not. Is there any chance that Hecht wrote his uncredited version of the screenplay inspired solely by the punch-drunk goofballing of two exhausted filmmakers without so much as glancing at any previous draft? Not for a second.Is it entertaining and amusing anyway? You bet. This is one example of a writer writing that is anything but boring. 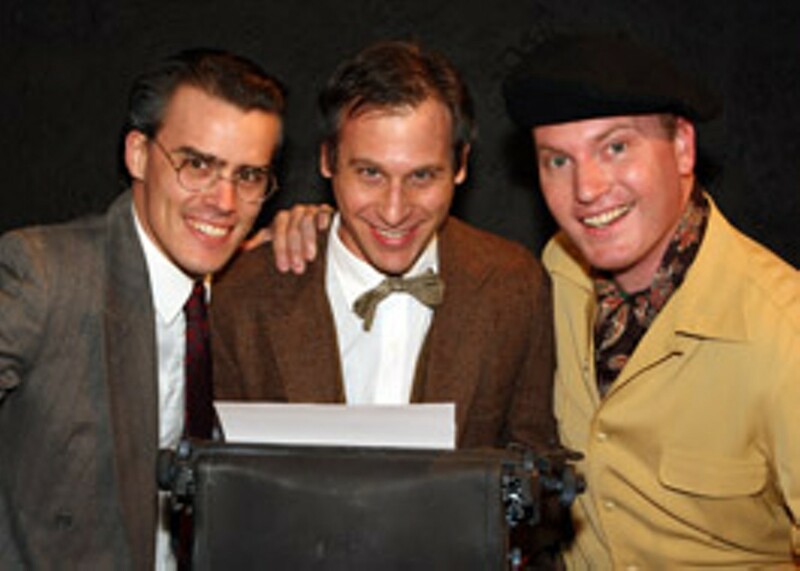 Kicking off the Rep's 15th anniversary, director Jennifer King has given Hutchinson's loosey-goosey script a touch-up of her own, imbuing the antics of the three main characters with a solid dose of Marx Brothers&–like shenanigans just this side of pie-throwing. By spotlighting the humor of the situation, King sidesteps what could have been a very dark slog, as the three men slowly lose their minds while debating everything from the inherent badness and inappropriate racial notions of Mitchell's epic, to the soul-sapping contradiction of being a wealthy Jewish filmmaker in a town that—this being set in 1939—does not allow Jews to join country clubs. The darkness of Hutchinson's play is still intact, but with King's inspired directorial nonsense, this production takes on a manic-depressive weirdness that is perfectly suited to a play so broadly and fantastically sketched. With a nicely detailed studio-office set by Doug Faxon, the energetic and youngish cast (all about half the age of the people they are portraying) give action-packed, mostly convincing performances. As Hecht, a screenwriter who was legendary for hating the source material he was forced to doctor, Scheuer plays his character's frustration and dismay with potent, palpable discomfort. Ben Stowe, a Rep mainstay, gives one of his strongest performances to date, convincingly blending Selznick's obvious megalomania with a charmingly sweet love of film. And Yarish, while not quite conveying the exhausted insanity of Fleming after days of being locked in an office and fed only bananas and peanuts, does exude a veneer of comic macho arrogance that makes it all the funnier when he's playing Scarlett O'Hara's more simpering tirades.A nice additional surprise is Denise Elia (hot off a sensational run in the Loading Zone's seething Macbeth) as Selznick's shell-shocked secretary Miss Poppenghul. With little to do through most of the play beyond uttering "Yes, Mr. Selznick" and "No, Mr. Selznick," Elia still manages to incite huge gusts of laughter, sometimes with little more than a gesture with a pencil and the raising of an eyebrow. 'Moonlight and Magnolias' runs Thursday&–Saturday at 8pm through Feb. 24. Also, Feb. 17 and 24 at 2pm. $18&–$23; Thursday, pay what you can. Sonoma County Repertory Theater, 104 N. Main St., Sebastopol. 707.823.0177.